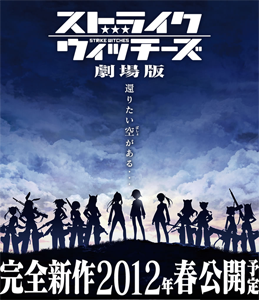 Manga adaptation animation Strike Witches (ストライクウィッチーズ) is releasing a movie this coming March 17. Viewers can get anther round of adventure with Yoshika, Mio, and the rest of the moe gijinka girls who are taking their battle up to a new level. New characters are appearing on screen, generating a new exciting storyline from its original plot. The Strike Witches production releases a two minute trailer, dishing out movie excerpts for fans to enjoy. The movie goes forward in 1945, where the main character Yoshika, loses her witch abilities and decided to study with hopes of becoming a doctor. But upon the arrival of one of her cadets in the Imperial Fuso Navy, Yoshika was led into another destination; this time, in Europe, where she faces a new dilemma for the Strike Witches during her study in another land. Fans won’t be disappointed as the movie promises its familiar mecha-driven encounters along with the other cast of the anime. Strike Witches is conceptualized and created by Humikane Shimada. The story was set in a different Earth during the mid-twentieth century. Half human, half machines, moe gijina girls become part of the military where they use their magic and technology to protect the world from evil forces. Staged upon a fictional conception of the World War II, these cadets worked hand in hand to combat against alien threats, rather than fighting against one another. The title is based from the idea of young women with rich magical powers who are enlisted in the army in order to go against Neuroi, a swarm of supernatural creatures invading human territory within the year 1939. This enigmatic adversary attacks without warning throughout the entire world without caution, making use of their aircrafts and hazardous fog in order to destroy their opponents. In order to save the planet, the worldwide military equips girls with a machine attached to their legs, giving them the ability to fly. With floating capabilities and magical techniques, thee girls are named Witch Strikers and are sent as the first line of defense against these alien forces.